It's impossible not to grow older; however, people can grow old gracefully and feel much younger than their years if they stay active. Exercising both the body and the mind regularly can help you feel younger than your physical age and add years to your life. Seniors who exercise regularly feel younger than those who are mainly sedentary. Although you may not be able to do certain exercises because of health conditions, you can find ways to exercise that are fun as well as healthy. Joining your local Y or a gym that has trainers that specialize in helping senior citizens maintain their health can both contribute to your longevity. These types of activities are preferable to solitary exercises because they allow you to spend time with other people. The food you eat can contribute to energy or its lack. It's even more important for older people to eat balanced meals than younger ones because your metabolism slows down as you get older. This means that if you eat foods that are high in sugar or fat, these foods will be harder for your body to process. In addition, if you don't eat healthily, you will gain weight more easily and find it harder to lose again than you did when you were younger. Talk to your doctor about a healthy diet for yourself. Some senior citizens have diabetes, heart conditions or other health problems that require them to avoid certain foods or follow a particular diet. Your doctor can help you create a diet that is healthy and meets all of your needs so that you can feel energetic throughout the day. It's important to be active socially as well as physically. Many senior citizens feel isolated because people they love may have passed away or health conditions make it harder for them to take care of themselves than it used to be. Talking with friends and family on a regular basis can help you feel connected to your family and community. People who are connected are less prone to depression, which can zap energy and make you feel old. If you know your way around a computer, consider getting a Facebook account so that you can easily keep up with friends and family. If not, you should make the effort to call regularly, send cards and gifts on special occasions, and visit with friends and family as much as you are able. Mental activity is an important part of your exercise program. Do crossword puzzles, Sudoku, or whatever other types of puzzles you enjoy that will challenge your brain. Playing memory games with your grandchildren is another excellent way to exercise your brain, and doing so allows you to spend quality time with your family. Many senior citizens rely on driving or being driven. If you are able to walk, you should do so as much as possible instead of driving. 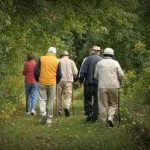 Walking is an excellent form of exercise that allows you to get fresh air. Taking frequent walks can help you to lift your mood and feel younger. Mark Carol is a health writer for Assisted Living Today, which is a leading resource for finding health care tips for aging adults, and Arlington, TX Assisted Living facilities.